May is almost here! With it comes the beginning of outdoor everything – markets, festivals, celebrations, dancing, music, and athletic events throughout the Boulder area. It will all culminate on Memorial Day weekend with the Boulder Creek Festival and of course, the BolderBOULDER. Get out your calendars and get ready for sunshine and fun with these 31 things to do in Boulder in May. Cost: $20/runner, $7/dinner ticket for non-runners. Tickets available here. The Dash & Dine Run 5k run is Boulder’s favorite spring tune-up race series. This family friendly race is a series of six races Tuesday nights in April and May held at the beautiful Boulder Reservoir in Boulder, CO. The Dash & Dine 5k is all about friends, fun, and a family atmosphere with a mix of veterans, beginners, and seasoned professionals all racing together. After each race you’ll have a chance to relax, kick back with friends and make a few more while enjoying the post-race dinner, awards ceremony, and raffle prizes. The Spot has teamed up with Fractal Tribe to bring you a night of dynamic acrobatic movement and splendor at Summer Jam! Events include demonstrations happening around the gym all night, from aerial nets to fire dancing to climbing workshops. McDevitt Taco Supply will serving tacos and Avery Brewing Company will offering free beer! Entrance is free. Click here for all the details. CU Swing Dance is hosting a free Dance Lesson and Social Dance. Never Danced Before? No problem! We will have beginner and intermediate lessons at 7:00PM. This will be followed by a social dance at 8PM. No dance partner is required, but feel free to bring your friends! Just make sure to wear some flat-soled shoes to dance in. Cost: $25 – $30, tickets available here. September School presents Women Rock Boulder at the Boulder Theater – a benefit concert for the scholarship fund. September School, now in its 44th year, is Boulder’s oldest independent high school. A relationship-based learning community, September School prides itself on being a place where students are seen and heard. Women Rock Boulder is a benefit concert for our Scholarship Fund. Featuring artists Tracksuit Wedding, Erica Brown, and Kerry Pastine & the Crime Scene, this show will be a rock and roll party in celebration of September School. Farmers’ Market season is back! Offering fresh fruit, flowers, veggies and delicious edibles, the Boulder County Farmers’ Market provides a place for locals to sell their products in a friendly, fun environment. Twice a week, residents and visitors can fill their bags with goodies. With a drop from a giant bucket, thousands of little yellow rubber ducks are ceremoniously dropped into Fall River at Nicky’s Resort for the 30th Annual Estes Park Rotary Duck Race Festival. Adopt a $20 duck for the chance to win one of the hundreds of prizes offered, including a trip to Costa Rica or Mexico/Riviera Maya. Proceeds from the event go to over 60 different Estes Valley charities. These charities will receive 95% of the money collected from adoptions. It’s a fun family outing with lots of music and entertainment as well. Race festivities get underway at Nicky’s Resort at 11AM on race day. Ducks go into the water at 1PM and activities continue in Riverside Plaza until the last duck swims past the finish line. On race day, beginning at 8 am, Bond Park will feature FREE family fun, music, activities, duck sales and more! Get your duck online and find more details at EPDuckRace.org. Cost: $39 Tickets available here. Celebrated American rural folk pianist George Winston has just released his 14th solo piano album, Spring Carousel. George shares his life of musical study and inspiration with his own rural folk style as well as stride, R&B and slow dance songs from his favorite masters and composers. Each live performance is unique and may incorporate solo 7 string guitar and solo harmonica while benefiting local food banks. George Winston will be performing at the Broomfield Auditorium on Saturday, May 8. All ages. Please bring a canned food donation for the local food bank. Party like it’s 1984 at Gunbarrel Brewing‘s Back to the 80’s Dance Party! Nostalgia, hairspray, neon, shoulder pads & jelly shoes. Activities include giant twister and pin the glove on Michael Jackson. DJ Rockstar Aaron will be lighting up the dance floor with all of your favorite 80’s hits. Dance-Off with prizes! Who will be crowned Prom King & Queen? Brush up on your sprinkler, MC hammer & moonwalk, only the fiercest, most radical, most righteous, and definitely the most awkward moves will win! Gunbarrel Brewing Company will be releasing special beers just for this event! Food Truck will be available on-site. Join Boulder Parks and Recreation to celebrate the opening of the Civic Area Park’s Phase One of construction – the “park at the core” enhancements to Central Park. Enjoy a FREE afternoon of family-friendly activities, lawn games, exciting local food trucks and live music from Caribou Mountain Collective (Bluegrass/Roots) and Kaleidoscope Music’s House of Joy (Family/Children). Bring a picnic blanket and come enjoy the renovated Central Park and the exciting new Creekside Play Area. Cost: Adult $30, Senior $25, Student/Youth $20, Pack of 4 People $80. Register here. Emerge 5K is a family walk/run event, an empowering experience designed to raise awareness of youth suicide prevention efforts and bring support to the youth of Boulder County. Awesome live music will be provided by Kutandara. Post-race (free) refreshments from Button Rock Bakery, KT’s BBQ, Morning Glory Cafe and more. Proceeds from this event benefit the Second Wind Fund of Boulder County, a non-profit organization whose mission is to provide funded counseling services to at risk youth in Boulder County. The event is also designed as an opportunity for remembrance of those lost to suicide and a celebration of all who choose life. Register here. Join the Spring Broomfield Makers Market at Wonderland Brewing Company! Sip craft beer while you browse handmade, homemade, and one-of-a-kind goods from local artisans. We will have lots of gifts for all the wonderful mothers and teachers in your life. Come support local business and the handmade community! Join Boulder Running for the 2018 Induction Ceremony for the Boulder Sports Hall of Fame held at the newly remodeled Boulder Museum. This year’s Inductees are Robyn Rabatou for Climbing, Colleen De Reuck for Running, and Siri Lindley for Triathlon. Previous inductees for running include: Frank Shorter, Lorraine Moller, Benji Durden, and Arturo Barrios. The Hall of Fame was established in 2011 by a group of local athletes to honor and preserve the legacy of some of the all-time greats who lived and trained in Boulder on their way to becoming the best in the world in their respective events. The Boulder Sports Hall of Fame also honors one “Cornerstone Contributor” each year for accomplishments in helping make Boulder one of the world’s leading centers of sports. Cost: $42 – $65 Tickets available here. Humorist and best-selling author David Sedaris comes to Boulder for one night only at the Macky Auditorium. An evening of never-before-heard stories, Q&A and book signing. Always a sell-out! Don’t miss his only appearance in over two years. Presented by the Boulder Bookstore. Where: Colorado Railroad Museum, 17155 W 44th Ave, Golden, Colorado 80403. Cost: Boulder County Residents, Museum Members and Children under 2 are free. For all others fees are as follows: Children $5, Adults $10, and Seniors $8. Ride Tickets: Boulder County Residents Free. For all others: Adults (16+) $4, Children (2-15) $2. Museum members receive $1 discount per ticket. The Colorado Railroad Museum is proud to offer free general admission and rides behind a historic steam locomotive to all Boulder County residents on Friday, March 30. Catch a ride behind one of the Museum’s historic steam locomotives in vintage passenger cars. The Colorado Railroad Museum features over 100 narrow and standard gauge steam and diesel locomotives, passenger cars, cabooses and G-scale garden railway on our 15-acre railyard. Also, see the exhibit galleries, renowned library, roundhouse restoration facility and working turntable. Cost: $30/person. Kids 12 and under are FREE. Tickets available here. The Estes Park Mountain Music Festival is an annual musical extravaganza featuring national and local bands and fun for everyone! Music line-up includes Trout Steak Revival, Gasoline Lollipops, Heavy Beauty, Chain Station, Banshee Tree, Monocle Band and Great Blue. The festival is an all day event with great music, food and beverages, vendors and family-friendly activities. The City of Boulder Parks and Recreation Department is hosting a Cultural Diversity Celebration at the newly renovated Howard Heuston Park. The department is partnering with The Family Learning Center to host a celebration in the park with activities including music performances from local artists, fitness demonstrations and soccer clinics. There will be multicultural entertainment, youth sports strength and conditioning camp, dancers, local bands, turkey hot dogs, fruit, water and other healthy snacks. Arts and crafts for children, including face painting, and community partners will provide invaluable information on a variety of community resources. For more info, click here. Cost: $32.23/person. Tickets available here. Mudrock’s Tap and Tavern will be hosting the 3rd Annual Not Too Fancy Fest, featuring a lineup of Colorado Craft Beers and Ciders for guests to sample. Once again, Mudrock’s will be roasting a whole pig for everyone to enjoy. Entertainment includes live music from local favorite, Flash Mountain Flood. All proceeds go to the Boulder Valley Humane Society. Cost: $30/person through April 30, $35 after May 1, Students $5 off. Tickets available here. A dancers’ ball…join Wild Goose & Wild Asparagus Balls the elegant Avalon Ballroom in Boulder for a night of beautiful live music and dance the night away at the 67th Annual Wild Asparagus Ball. The Mostly Strauss Orchestra (Denver Pop Orchestra) will play classic waltzes and polkas by Strauss and Shostakovitch as well as down-to-earth 20th century dances by Mancini, Leroy Anderson and Duke Ellington. Attire is formal and semi-formal. Dance cards will be available. Includes performances by CSM Perpetual Motion dancers. For details, click here. Hosted by the Colorado Shakespeare Festival, the 2018 Will Power Festival features six elementary schools performing Love’s Labour’s Lost! The event includes a parade along the Norlin quad, welcoming ceremony and performances by students from Whittier, Lafayette, Crestview, Douglass, Friends’ School and Running River. For details and schedule, click here. Cost: TBA Check the Boulder Century Theatre 16 website and the Westminster Promenade 24 website for tickets as the date comes closer. The documentary film, RBG, will be playing only at select theaters/times. At the age of 84, U.S. Supreme Court Justice Ruth Bader Ginsburg has developed a breathtaking legal legacy while becoming an unexpected pop culture icon. But without a definitive Ginsburg biography, the unique personal journey of this diminutive, quiet warrior’s rise to the nation’s highest court has been largely unknown, even to some of her biggest fans a’ until now. RBG is a revelatory documentary exploring Ginsburg ‘s exceptional life and career from Betsy West and Julie Cohen, and co-produced by Storyville Films and CNN Films. See the trailer here. Times and ticket prices will be announced at the dates get closer – check the Boulder Century Theatre 16 website and the Westminster Promenade 24 website for tickets. 22nd Annual Erie Town Fair and Balloon Festival hosts over 200 craft and food vendors; performances on stage at Coal Creek Ball Park offer a variety of entertainment by local groups, carnival games and hot air balloons. Hot air balloons launch at 6:15 am on Friday, Saturday and Sunday at Colorado National Golf Club, 2700 Vista Parkway, Erie. Saturday, May 19, the Town Fair will host vendors from 10:00 am – 4:00pm at Coal Creek Park. Garage Rats Car Club will be hosting the Car Show. Don’t miss the fabulous Balloon Glow at 9:15pm, as well as fireworks to conclude the day’s festivities. Cost: $22 – $30, Tickets available here. The Boulder Ballet will be performing one of the oldest continuously performed ballets, Giselle at the Dairy Arts Center. Giselle is about a peasant girl who dies of a broken heart after discovering her lover is betrothed to another. The Wilis, a group of supernatural women who dance men to death, summon Giselle from her grave. They target her lover for death, but Giselle’s great love frees him from their grasp. Music by French composer Adolphe Adam (1806-1856). Choreography after Marius Petipa. Cost: No registration fee. Participants encouraged to raise funds. Register here. When you participate in Walk MS, you make an impact on the lives of people affected by MS. Boulder’s 2018 Walk MS will bring family, friends and co-workers together to make a powerful force. Together, we will end MS forever. Click here for all the information you will need to have a fun and memorable day while participating in Walk MS with your friends and family! If you have Walk MS questions, please contact the Fundraising Support Center at 1-855-372-1331 or FundraisingSupport@nmss.org. Cost: FREE Music Fest. Advance Beer Ticket Package $15, VIP Ticket Package $65. Tickets available here. Upslope Brewing Company is hosting the 5th Annual Upslope Get Down, presented by Flatirons Subaru — a FREE music fest with Upslope beer, food trucks, games, art, vendors and more. Enjoy a day full of live music on 3 stages, featuring ORGŌNE, Guerrilla Fanfare, Tenth Mountain Division, The Jive Tribe, Steepland String Band, Kessel Run and Boot Gun. 21+ event; however, we’re family friendly! Anyone under 21 must be accompanied by their parent or legal guardian. Please leave your four-legged friends at home. For all the details, click here. Cost: $8 – $12 Bloomapalooza included with general admission. Tickets available here. Explore the sights, smells, textures and tastes of plants from around the world and get inspired to conserve them at Butterfly Pavilion‘s Bloomapalooza! The event includes a pollinator plant sale, hands-on gardening activities, incredible plant and animal encounters, delectable tastings in our beer & mead garden featuring Wonderland Brewery and Queen Bee Brews, and much more! This is event is included with General Admission and is great for all ages. Get out of the house and have some fun with nature activities at Louisville’s Cottonwood Park! Kids will learn about environmental stewardship, learn to use binoculars, and interactive activities such as compass and navigation skills, casting animal tracks, and looking at animal pelts in a nature setting. The goal of Kids to Parks Day is to connect kids of all ages to parks; to enjoy the outdoors, learn from these wonderful outdoor classrooms, and instill the importance of stewardship. Kids to Parks Day engages parks across the country including local, state and national parks, and public lands and waters. Where: Boulder along the Boulder Creek corridor, extending from Broadway to 14th Street (west to east), between Canyon Blvd. and Arapahoe Ave. (north and south) Click here for a detailed map. For over thirty years, the Boulder Creek Festival® has been the unofficial kickoff to summer in Boulder. The Memorial Day weekend festival includes three days of festivities featuring a large variety of events, activities, food and entertainment unique to the Boulder community. Featuring nine separate event areas with 500 vendors showcasing everything from community arts and crafts to healthier alternatives and technology while a spectrum of music and dance is performed on three performance stages. The festival also features carnival rides and food and beverage vendors. Cost: $35 – $80, Register here. 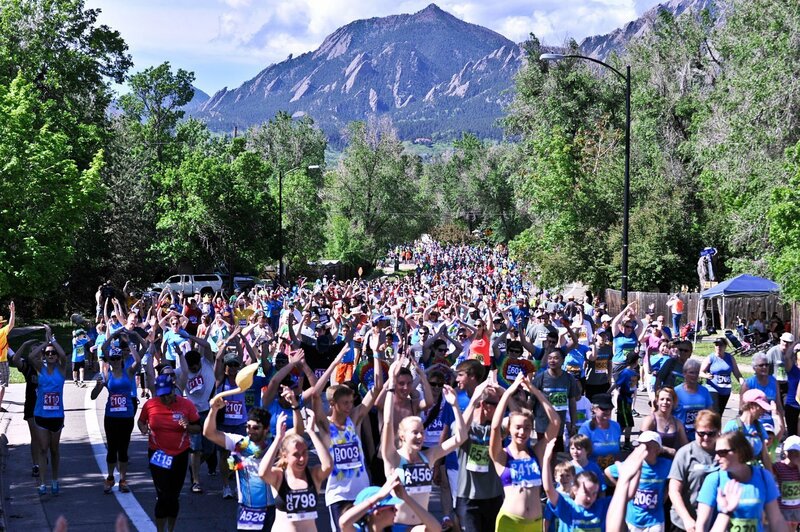 BolderBOULDER is one of the largest and most highly acclaimed 10Ks in the world. Whether you want to run or enjoy watching, BolderBOULDER is a ton of fun! Almost 1.2 million runners, joggers, walkers and spectators of all ages have gathered over the years to create a spectacle that defies description. Olympic medal winners and hopefuls, grandmothers and kids, running enthusiasts and one-race-a-year guests from all over the world come together at the foot of the Rocky Mountains to form one of the sport’s truly unique events. Each year BolderBOULDER hosts 50,000+ participants and 100,000+ spectators throughout the course for what we like to call the biggest and best Memorial Day celebration on earth. Stone Temple Pilots are on tour and will be making a stop at the Boulder Theater! The band has just released its seventh studio album – its first with new singer Jeff Gutt, a veteran of the Detroit music scene. The Dirty Hooks will open the show. For all the details, click here. Thanks for including the Estes Park Mountain Music Festival on your list. People of Boulder, come on up! It’s going to be amazing!! !